Jessica and I met at a fair and she subsequently dropped me a line to see about remodelling a "little" antique emerald ring that had belonged to her grandmother. When we met up the emerald was scratched and chipped from years of continuous wear so the first thing I suggested before we settled on any design was to send the stone off for repolishing to see just what we were dealing with. My hunch was right and what we received back was a truly stunning emerald cut emerald with great life and sparkle as well as a really beautiful colour. 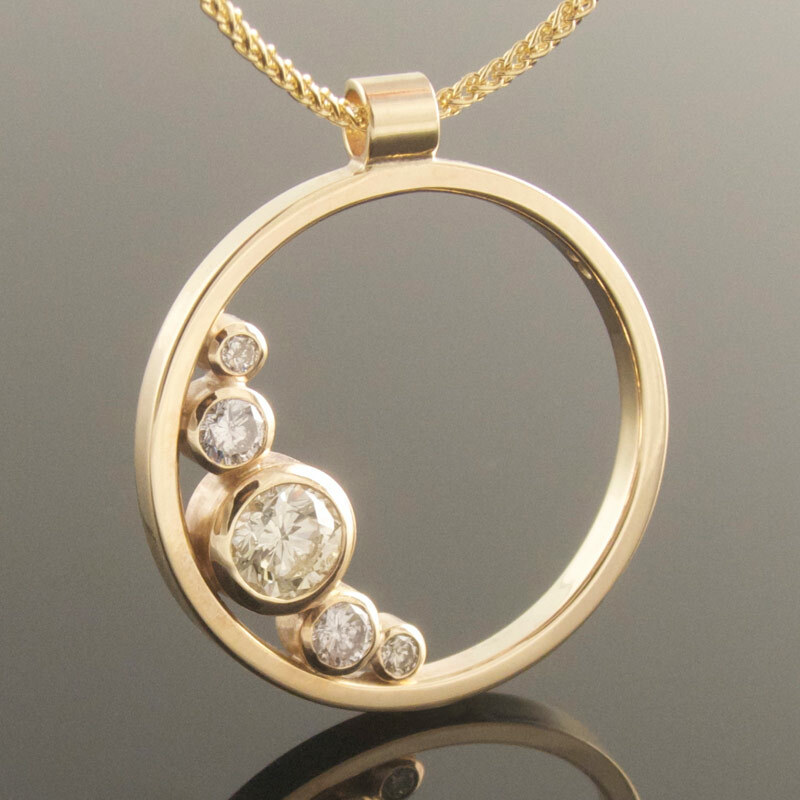 Seeing this newly transformed stone Jessica didn't want to stray too far from the original design, however it was important to her to get rid of the gappiness between the accent diamonds and to create a refined, low mount. I did up some drawings of what we'd discussed and took them to be transferred on to a CAD file. Renders were exchanged and with a little tweaking the design was completed and ready to be cut directly from wax. This model was then cast in 18ct white gold, assayed and cleaned up in readiness for setting. The finished emerald ring is similar to the original, but with a weightier shank more suited to a modern lifestyle and that gappiness I mentioned has been banished by employing shared claw settings on the shoulders. The shank is broader and heavier at the back where it will receive most wear, but tapers elegantly towards the setting creating a refined look and the once jaded emerald has been repolished and reinvigorated making this little stone the belle of the dress ring ball. If you have project you'd like to discuss please feel free to drop me a line at evadorney@gmail.com or give me a tinkle on 0877956321. Meantime if you liked this blog feel free to share OR press the little icon below to be showered with hearts! I have been very remiss in my posts here lately, but rather than start from where I left off I intend to jump forward in time and tell you about a recent engagement ring remodel that is now adorning one happily engaged finger. Nuala and Caolan approached me before Christmas to see whether I could take some of their old gold and turn it into their wedding rings and also source them a ruby for Nuala's engagement ring. Happily they were in no rush so I suggested I would source the stone in Germany while at the Inhorgenta trade fair in February - the selection of stones there is second to none and as it was important to them that the stone be ethically sourced this allowed for a more vigorous questioning of suppliers! Initially I was tasked with finding a deep red ruby similar in size and shape to that of my own emerald cut diamond engagement ring, however finding said stone proved more difficult than imagined and so we widened the search to include larger oval rubies too! There was a bit of toing and froing before we settled on a real beauty from Tanzania weighing in at a hefty 1.82cts. The change in shape and size of stone meant a slight rejig of the overall ring design making it curvy rather than angular and indeed quite a bit heavier than originally anticipated. When I got back to the workshop I set about melting enough metal to make the ring and started to forge out the shape using the rolling mills. However, as is sometimes the case with remelted metal, the resulting nugget was incredibly hard and unbending so having enlisted Dave's help in a vain attempt to bend it I had no choice but to reconsider how it would be made and start carving a wax model from which to cast the ring instead. The trick to creating a symmetrical design in wax is to lay out guidelines before removing any wax and thereafter to reestablish the guidelines as you go. Wax is much faster to work than metal so it is very easy to go too far and remove too much material, but I'd recommend giving it a whirl if you're at all crafty. The blue wax master was then sprued before undergoing a lost wax casting process during which the old gold was melted and poured into the ring shaped cavity left by burning out the wax. It's always necessary to use more metal than required and you can see a big nugget of additional metal on the side of the ring which has since become a matching wedding band. There followed a spot of assaying, sprue removal, emerying and polishing before the ruby was ultimately set across the finger to create a lovely contemporary ruby engagement ring. If you have a project you'd like to explore please feel free to drop me a line here or pick up the phone and give me a bell on 0877956321. When Sarah contacted me she had a lovely thick 18ct ring and another broken 22ct wedding band that had been passed down through her boyfriend's family. She also had a little gold bracelet of her own and a great desire to make him a very special pendant for his 40th birthday. Originally the design included the spiral of life with an emerald at it's centre for abundance, but a little redesign brought us to setting the emerald in the centre of the circle like before, but with a six pointed star on the reverse - again symbolising abundance. 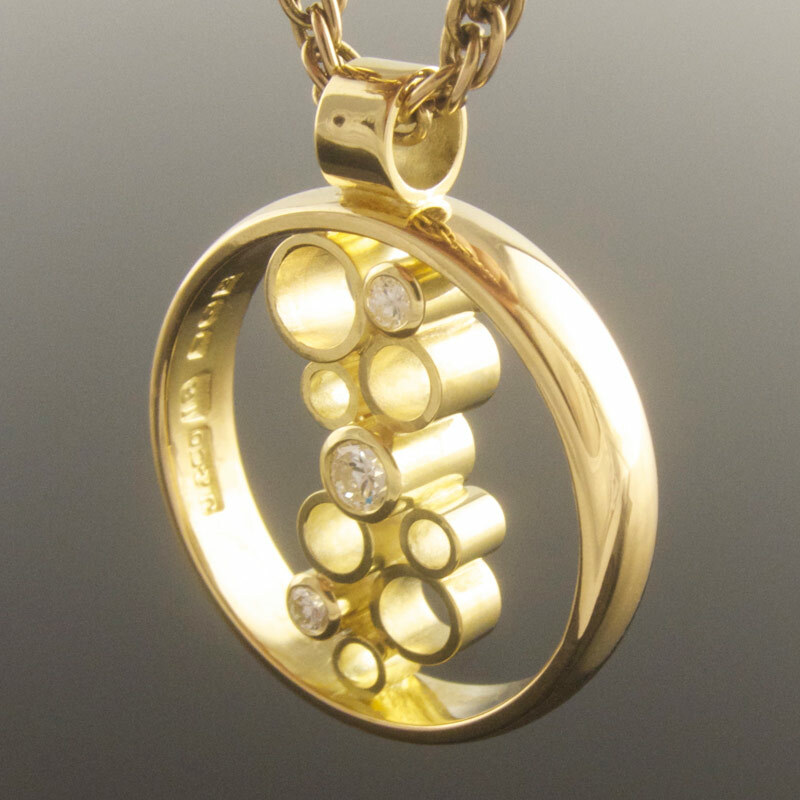 There wasn't quite enough metal to make a disc large and heavy enough as things stood, so we decided to add an a further 6g of 9ct yellow gold to the mix just to bring up the weight. Some of this additional metal went to make the bale and the setting before the rest went into the pot to be melted. Usually the ingots of gold are long and rod shaped but on the flip side of the ingot mould there is a wider opening for making small amounts of sheet metal. Invariably it comes out lumpy and uneven but as usual the trusty rolling mill flattened out the bumps and pressed the gold into submission! From this knobbly little sheet I marked and cut out a generous disc and started to work assembling the bale and setting which you can see just held in tweezers midshot. I seem to have forgotten to take any further photos and suddenly we have the finished piece! Roughly speaking I hammer textured the front of the pendant before setting the emerald and then sending it off to be engraved with the six pointed star on the reverse. Sarah planned to give Jason his gift at the top of Croagh Patrick but while they climbed the Reek she hadn't the heart to make him wait for his pressie! I first met Dervla and Denis back in February of this year when they approached me about making their engagement ring. They were looking for a simple yet confident ring, suited to architect Dervla's aesthetic. Having done a little homework she had her heart set on a nice big deep blue sapphire and as luck would have it I was headed to one of the biggest jewellery trade fairs of the year in a matter of days. No better place to find just the stone! With a budget in mind I spent quite a while seeking out a sapphire with the perfect balance of colour, sparkle and scale. There were phone calls to and fro describing the three front runners and numerous return visits to all three. I had mistakenly thought I could take snaps on my smart phone to help inform the decision, but flourescent lighting is no friend to photography and the results were mixed at best! Nonetheless we came to a decision between us and I returned to Ireland with nerves in my belly hoping that Dervla would love her new sapphire - happily she did and on her next trip back from London there was a silver sample ring to try. With that viewed and agreed it was time to order the metal and start work on the engagement ring proper. 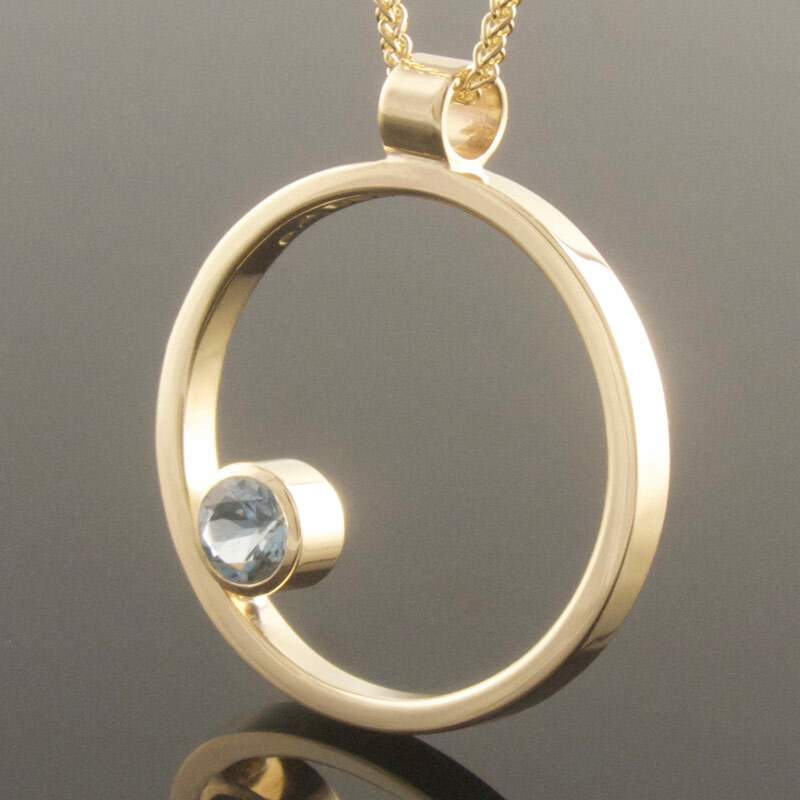 As you can see it started out with just three elements, the sapphire, a length of 18ct yellow gold bar for the shank and piece of sheet from which to make the setting. First of all I made up a tapering round setting from the sheet and formed it in to an oval to match the curve of the sapphire. Next I made the 2.5mm wide shank and removed a section where the solder seam was to accommodate the oval setting - no point having more seams than necessary. The two elements were then soldered together and dropped to the assay office in Dublin city to be tested and stamped. With that accomplished it was time to clean up the ring, remove any scratches and prepolish the inside of the setting. 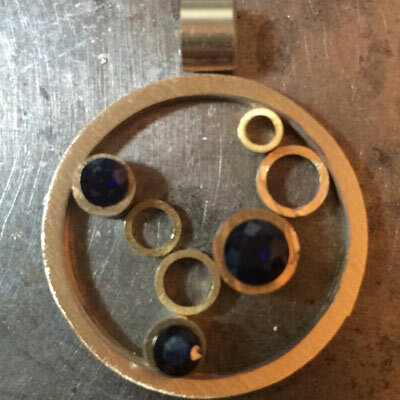 I then created a seat for the sapphire by removing metal from the inside of the bezel and pushed the yellow gold down onto the stone to hold it. A last polish and a little directional emery applied to the shank and that was that! Dervla and Denis were back in town last weekend and came to collect. Impressively Denis had refused to see a picture of the ring before the big day preferring to "wait until I see it on Dearbhla's finger". I'm pleased to report that they left a very happy couple and that there may or may not have been tears! First things first...Yvette and Jay live in London and ordered their engagement ring via correspondence! You have no idea how impressed I am with them for taking such a leap of faith. They had come across my work over on One Fab Day and picked up the phone to place their order. In the absense of a face to face meeting Yvette and I chatted about the shape of her hand, about skin tone and about the kind of work she does. That last one may seem strange, but lifestyle can really impact your choice of metal and stone. As she didn't intend to wear her engagement ring every day the whole range of gemstones was available to her including this relatively soft peridot which just so happens to be Jay's birth stone. The top left image details the raw materials - two pieces of gold, one long for the shank and one wide for the setting and the lovely green peridot. 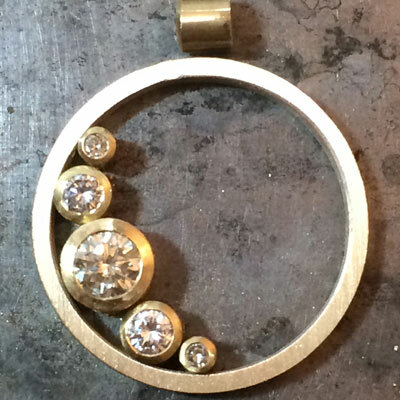 First the wider piece was turned up into a conical bezel setting and then the longer length of gold into a ring. The two pieces were then fitted together via a series of cutting, filing and offering up the setting to the gap in the ring. When they fit perfectly they were soldered together with a little excess setting protruding. This excess was filed away before emerying and cleaning up the ring to take the peridot. And here we have the finished ring which the guys flew in to collect one Monday morning. They are planning their wedding here in Dublin later this year and I wish them both the very best! When we first met, Isobel had a gold necklace that didn't fall quite right, along with some other little bits of gold jewellery and an array of stones. There was no shortage of possibilities, but a pair of faceted oval topaz stood out amongst her collection of gems and we plotted to make a dressy gold drop earring with a little movement to catch the eye. As you can see from the scales we started out with 14g of gold which is well in excess of what was needed to complete this project so you'll be glad to hear that the troublesome necklace became a not so troublesome bracelet before the balance was melted. Earrings like these require a number of different gauges of metal so I melted the gold into different little nuggets to create the bar for the stem, the flat sheet for each setting, not to mention the tiny little jump rings that would make the earrings bob. 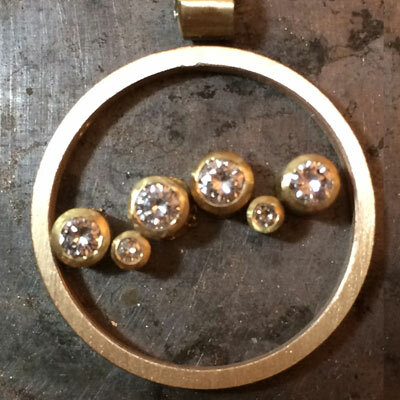 Each nugget was in turn milled and formed before being soldered together. The topaz were then set and everything was given a good polish before finally bending the stems into a dramatic hook. If you liked this post embrace the little grey heart to your right!